I’ll add additional posts as I run into new things, here are my notes so far. The Simple installation may take a while. And may look like it is hung, and may prompt to “disable scripts that are causing this window to run slowly”. Don’t cancel the scripts, just be patient. During installation you are required to set a complex password for SSO. However, once installed you can change that password to anything 5 characters or longer incl “12345” and “password”. Please note those are not suggestions, but that is the same combination I use on my luggage. Install Firefox. The webclient just runs better on the Fox. Still very slow compared to the C# client, but much better than under IE. Install Adobe Flash. And you might need to get it here – in my environment the link at Adobe never completes installation – but it does automatically remove the installer regardless of installation completing. If you login to vSphere as the local windows admin and no vCenter Server appears in the list, that is because the local admin has rights to login to the webclient but no no longer gets automatic access to vSphere. 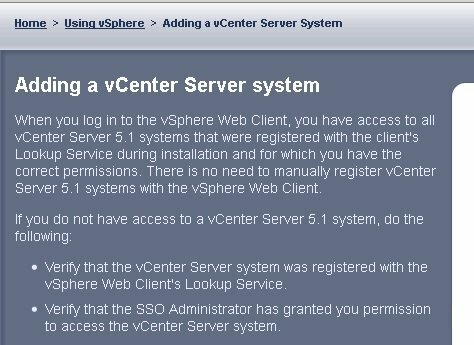 So you’ll have to login using administrator@vsphere.local to grant permissions. Once logged in, go to Administration / Configuration / Identity Sources and add your AD domain so you can give your AD accounts permissions and turn on integrated authentication. The vSphere 5.5 Web Client thinks it is 5.1. See, I told you it was slow! This entry was posted in Cloud, Computing, Virtualization, VMware and tagged 5.5, vSphere. Bookmark the permalink. Thanks for this! Wish I’d seen it a week ago when I ran into exactly these issues!